We are days away from Thanksgiving, and as we prepare for our annual feast, the perennial question comes up - is a yam the same thing as a sweet potato? I've wondered about this for as long as I can remember and this year, I decided to do some research. As it turns out, yams and sweet potatoes are not related botanically. Yams are monocots, related to lilies, and belong to the family Dioscorea. 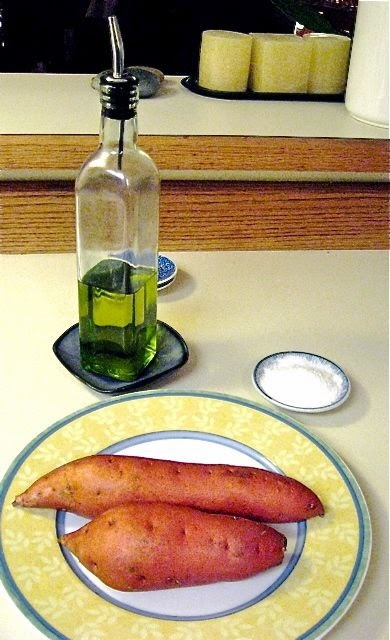 Sweet potatoes (Ipomoea batatas) are dicots, from the Convolvulaceae family, the same as morning glories. As near as I can tell, true yams are not grown in the United States, at least not commercially. They are a staple crop in West Africa, where 95% of the world's production is cultivated. There are many varieties of yams, including those that produce tubers over 4 feet long, weighing over 150 lbs! I've never seen any of those at the grocery store. Sweet potatoes, on the other hand, are grown in the US: with North Carolina, California, Louisiana and Mississippi leading the way in production. Apparently, those "candied yams" that people serve on Thanksgiving are in fact sweet potatoes. So now the question is: Why do we call sweet potatoes "yams?" It makes no sense. We don't grow them in the US, so most of us have never seen, never mind eaten, a true yam. I found the answer on The Kitchen Daily blog. It happens that sweet potatoes resemble certain varieties of yams. When slaves were brought to the US from West Africa and saw sweet potatoes, they thought those tubers were yams. And that's what they called them. The name stuck - and now you know why.